Last year EA Sports attempted to entice consumers to try NBA Live 18 by aggressively dropping the price post-release. Prior to that though they also hoped to generate some pre-orders by discounting the price of the game for day one down to $40 (it went up to $60 upon release). Even at the lower price it was probably asking too much to expect all but a few to commit to a game that wasn’t guaranteed to be up-to-par given the history of the series over the last decade. Now though, coming off the most well-received iteration since 2009 and with a sense of some stability in place, there is likely to be a far more considerable crowd that is confident enough in the upcoming NBA Live 19 to put money down on it early. In that case there’s another opportunity to get the game at a significant discount. NBA Live 19 can now be pre-ordered at a price of $40 or even lower for EA Access subscribers on Xbox One where it comes in at $36. For now at least the catch is that the purchase has to be made through the link to the store from within NBA Live 18. It’s unclear whether the deal will open up to other avenues later as there were no restrictions on how or where to pre-order last year. For those who already own the game or have it through EA Access on Xbox One that’s not a problem. 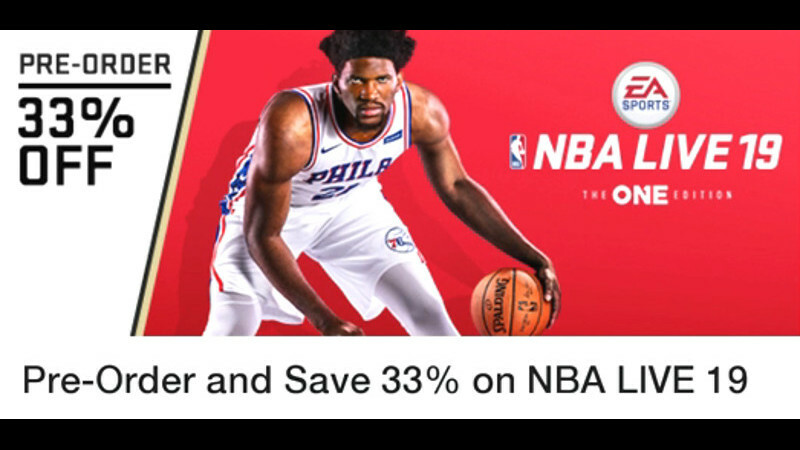 However there isn’t a great option at the moment to capitalize and save money if needing to purchase NBA Live 18 right now. The game was available on multiple occasions to buy for as low as $5 but unfortunately that isn’t the case currently as it’s listed on the PlayStation Store and XBL Marketplace for $30.